Pinwheel blocks are such fun to put together. As common as a pinwheel is, there are still multiple variations. There is the classic pinwheel which are half square triangles rotating the same direction around a center point like in Colleen’s quilt below. And there are variations like the pinwheels in Rhonda’s quilt. However you make them, pinwheel blocks give a feeling of movement in a very linear way. Rhonda made this quilt to be a wedding gift. She used nautical prints and colors to make a quilt that would look great on a couch or in a sailboat. To finish this quilt she chose a pantograph called Airborne. This pantograph has some very nice swirls that can really help a quilt take flight. It added to the movement of the pinwheels and the sailing theme. It really is quite lovely! Colleen made Melissa Mortenson’s Patchwork Paddock Quilt using Melissa’s Derby Day fabric line. Don’t you just love that pop of green in the center of the quilt? It really draws your eye to the Ohio star within a star. 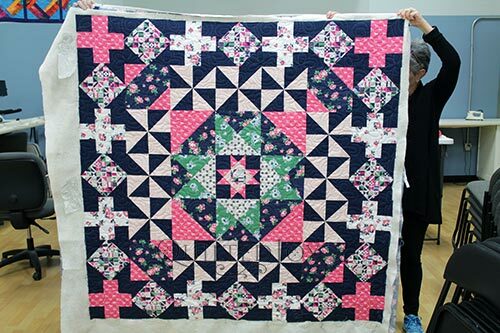 Colleen finished this quilt with the Toss Up pantograph. It is a sweet little design that looks like small petaled flowers with swirls. I think it adds some roundness and softness to a top with lots of straight lines. Classic blocks are classic for a reason. They’re aesthetic appeal can really read across generations. But you can easily give them a more modern twist with variations and playful fabric choices. Don’t write off a classic block too quickly. Previous post: New Angela Walters Rulers are Here and I’m so Excited! Next post: Certified Used APQS Longarm Machines Just Released!